​Our society exists "to increase the general interest in cultivation and improve the standard of excellence of the rose for all people. On March 3, 1950 a group of fourteen men, all enthusiastic Rose Hobbyists, met at the Central Library and organized the Men’s Rose Society of Birmingham. The first Rose Show was held in Vestavia in 1952. Since then, a Rose Show has been sponsored each year. In 1955, the organization was changed. 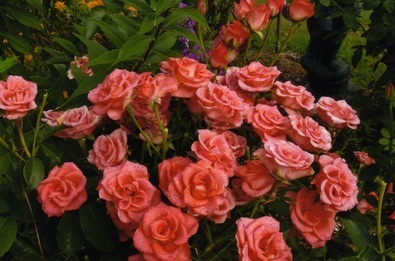 Ladies and anyone interested in growing roses, were made eligible for membership. At that time the name was changed to The Birmingham Rose Society. ​The Birmingham Rose Society meets on the 4th Sunday of each month; refreshments at 3:00 p.m. and meeting at 4:30 p.m..
One of the great joys of being a member of the Birmingham Rose Society is enjoying the camaraderie and friendship of fellow rose lovers. Visiting one another's gardens is a great way to see new roses and learn new growing techniques. From May till July we meet in members gardens. There has never been a better time to join!